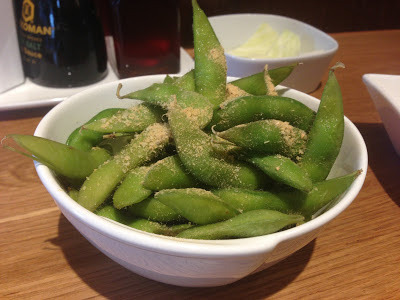 There are two possible reasons I can think of for the disastrous bowl of food I was served on my first visit to Shoryu. The first, and this is me in "benefit-of-the-doubt" mode, is that someone in the kitchen misread the reading on an unfamiliar pair of scales, and erroneously dumped twenty times the correct amount of wasabi into the recipe for Wasabi Tonkotsu. The second, more worrying possibility is that there really are people out there who would voluntarily eat what I can only describe as Pepper Spray Noodles and it was actually supposed to be like that. I have literally never been in so much agony in a restaurant in my life. 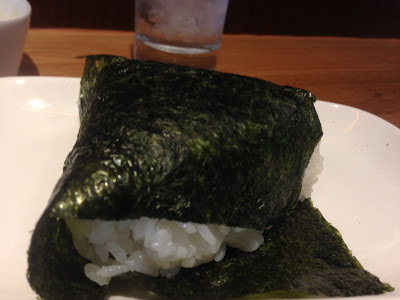 With the first mouthful of wasabi-soaked nori my throat closed up, my eyes started streaming and the most excruciating pain shot around my sinuses. This wasn't anywhere near a normal level of heat, this was a chemical weapon, deadly distilled mustard gas designed to incapacitate and maim. 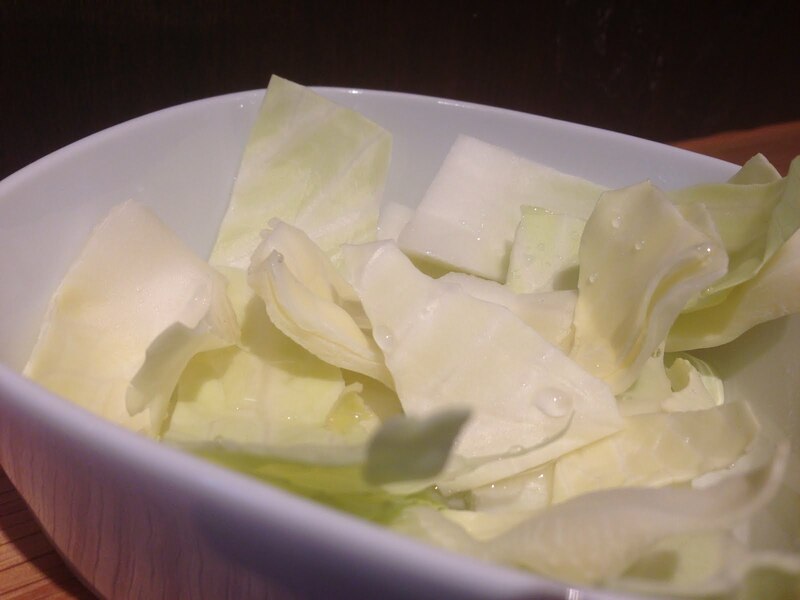 I can eat spoonfuls of English mustard without breaking a sweat, can happily polish off a plate of the infamous Silk Road hand-torn cabbage and have been known to only wince briefly during a portion of the Heron's laab ped, but this was something else. This wasn't lunch, this was being maced. I know, I know, I should have said something - I suppose I was just too shellshocked to speak. 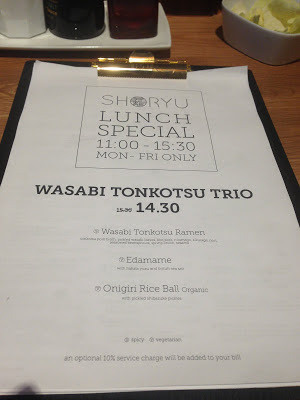 I wouldn't even have ordered it in the first place if it hadn't have been a daily lunch special but in fact, out of sheer curiosity I might go back and order it again just to see if the first time was a mistake. Because if it wasn't, and the Wasabi Tonkotsu from Shoryu is served like that to everyone, then I have a duty to inform the Department of Health. Not to mention the Ministry of Defense - I'm sure they could make use of it somehow. 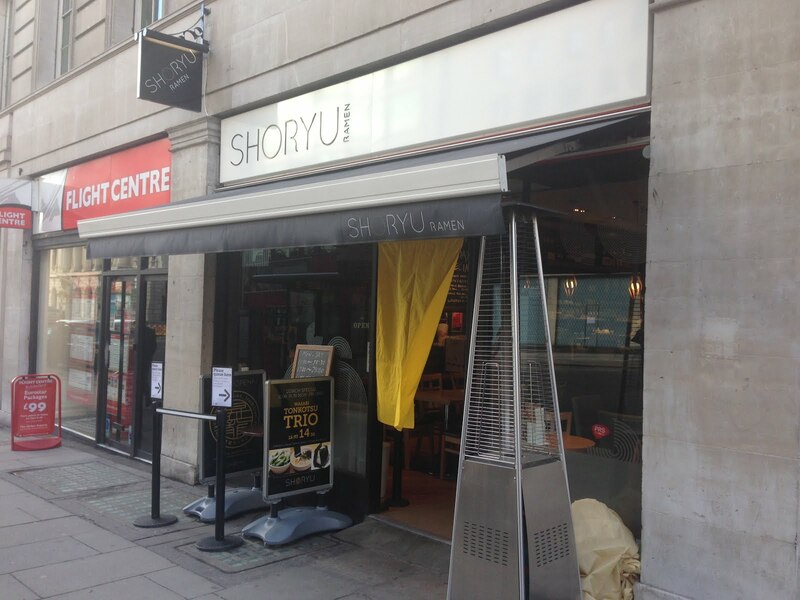 Having only just survived the Death By Wasabi Tonkotsu, then, I was in no hurry to return to Shoryu, but enough people rated it and enough positive writups online convinced me that perhaps not everything on the menu there was designed to cause permanent damage. So on a second visit I tried the standard house Tonkotsu ("Ganso") which was, thank God, not just edible but rather nice, with a soothing milky broth and generous helping of bouncy egg noodles. 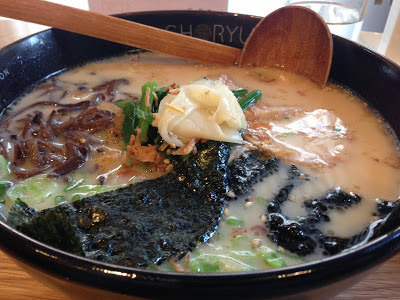 Perhaps the slices of rolled pork weren't quite as powerfully flavoursome as those at Tonkotsu on Dean St., and perhaps Bone Daddies has a slightly more exciting variety of styles, but this was still a good ramen. 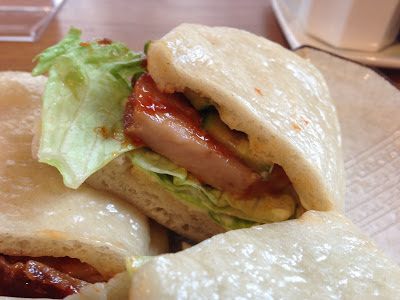 Hirata buns, ordered out of sheer curiosity rather than hunger as the Tonkotsu would have been a plenty big enough lunch on its own, were decent enough. I guess it's not their fault that I prefer the Korean style more, but cheap mayo and pork fat is not a combination I'd fight to try again and the bun casings were rather dense and wilted. Generous amount of them for £6 though. Of the sides, edamame would have been nicer warm and a parcel of onigiri rice stuffed with pickles was a strange side to pair with noodles on the lunch menu, but neither were offensive. These both came alongside the Wasabi Tonkotsu though, and I think a lump of nori-wrapped wire wool would have slipped down like ambrosia next to that. But as I say, I can't know for sure whether the Wasabi Tonkotsu was deliberate or not, and in the interests of fairness I will try and focus on the elements that didn't nearly cause hospitalisation; Shoryu is objectively is doing plenty of things right. 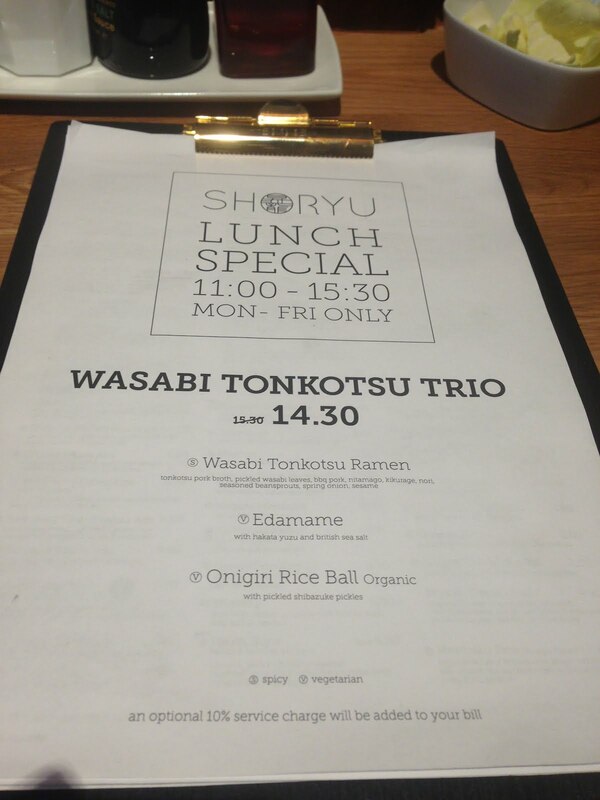 I only wish I had the time and money to try more of the menu, such as the fried chicken and soft-shelled crab that Bone Daddies do so well, but even just a very competent house Tonkotsu and a glass of water for £10 is a reason enough to visit, and based on the crowds flocking to 9 Lower Regent's Street, plenty are. 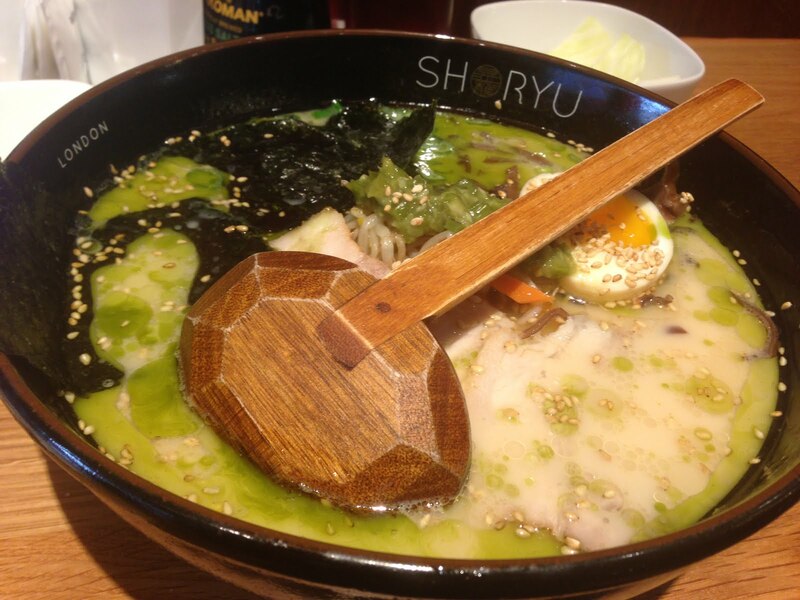 It's perfectly fine, it's just not my favourite of the new mini-wave of ramen joints in London. And that's not just because they may have tried to kill me. Honest.